At left, seven members of the Mercer County Community College Faculty Association were introduced to the Board of Trustees as “Examples of Excellence," this fall. 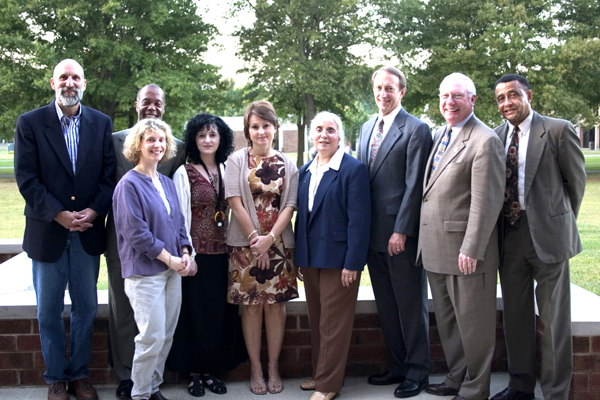 From left are Don Reichman, Gianna Durso-Finley (front), Alvyn Haywood, Kathy Paluscio, Diane Hilker, Josie Mathias and Robert Smith, with MCCC President Robert Rose and Faculty Association President Robert Pugh. Don Reichman, professor of computer science and mathematics, has for the past 27 years, taught the full range of mathematics courses from basic mathematics to calculus. He teaches at both the West Windsor and James Kerney Campuses and has taught in Trenton State Prison, Rahway State Prison and Yardville Correctional facility. In 1985, while teaching at Mercer, Reichman earned a master's in computer science at Stevens Institute of Technology. He then designed and implemented a major revision to the Computer Science program at Mercer. He teaches the full range of courses in that subject as well. He coordinated an Eisenhower grant which was awarded to Mercer for two years to train high school and middle school mathematics teachers. This grant, part of a national effort known as the “Algebra Project,” is focused on achieving math literacy for underprivileged students. Reichman was chair of the Mathematics department for many years and has served on numerous college committees. He was president of the Faculty Association. With a grant currently awarded by the Writing Across the Disciplines committee, he is exploring improving mathematics education through reading, writing and critical reasoning exercises. Reichman is a leader in his Hopewell Township community and currently serves as a fire commissioner. He has coached youth sports for the past seven years. Dr. Gianna Durso-Finley, assistant professor of humanities and social science and faculty assistant to the Vice President of Academic and Student Affairs, is a member of the American Sociological Association and the Eastern Sociological Society. She authored a paper on the difference in learning outcomes between online and campus courses and developed Mercer’s online version of Sociology 101. Durso-Finley is the adjunct coordinator for both the Sociology and Political Science programs. She serves on numerous college-wide committees including the College-Wide Forum, the Academic Foundations Committee, the Program Committee for Humanities and Social Sciences and the College Effectiveness Assessment Committee, where she is chair. Her expertise in institutional assessment has her very involved in steering the college's efforts for the upcoming Middle States Re-Accreditation. She has co-facilitated workshops for faculty on writing effective multiple-choice exams and developing teaching and learning goals. She revised the college’s Graduate Survey and is analyzing and reporting the survey results to all academic programs. A travel enthusiast, Durso-Finely has been to all 50 states and 5 continents. Alvyn Haywood, assistant professor of communication, who has taught at Mercer for eight years. Haywood chaired the college-wide Forum for two terms during a tumultuous period for Mercer. He has served on a variety of committees including his division’s personnel committee. Probably no faculty member has as extensive a student following as Haywood, and this is nor surprising because he practices what he teaches. Every other Wednesday he speaks to at-risk students who gather in the college’s quiet lounge, focusing on keeping those students in school. He speaks to various community and church groups around the county and around the state. He has spoken during African History Month at the federal prison at Ft. Dix and on the radio for Trenton’s Passage Theater. Haywood’s deep, vibrant voice is a pleasure to listen to no matter the subject. His activities range from innovative course design at the college to working with The Young ex-Offenders Support Group in Hamilton. Kathy Paluscio, instructor of communication, is one of the bright and creative faculty members Mercer has hired in the past few years. In the four years that this exceptionally popular instructor has been at Mercer she has revised the student newspaper and was awarded Student Advisor of the Year for her work with the paper. She has invented Mouthworks, a student performance group that produces dynamic vocal shows both on campus and in the community. She herself has written clever songs and performed them with her beautiful voice at faculty convocations. She has created mini-movies starring her colleagues that have charmed the campus. Currently she chairs the Academic Integrity Committee and has revitalized and streamlined the college’s efforts to deal with the ever-more sophisticated challenges of plagiarism and cheating. Paluscio is a brilliant new addition to the MCCC faculty. Diane Hilker, associate professor of biology, who has coordinated the Biology Program for the past 14 years and was named Mercer’s Distinguished Teacher of the Year in 1997. Hilker was an advisor to Phi Theta Kappa for 10 years and in 1996 was chosen to receive the Distinguished Regional Advisor Award. In 1999, she was named “Above and Beyond Advisor” by the Student Government Association. She has served on various college committees such as the Science and Allied Health Division Personnel Committee, the Faculty Forum on Teaching and Learning, the Curriculum Committee and the Academic Standards Committee. She is a member of several professional organizations including the American Society of Microbiology, the American Society of Clinical Pathology and the American Society of Medical Technology. Hilker’s teaching excellence was recognized by The National Institute for Staff and Organizational Development. This international organization, which emphasizes the importance of teaching excellence in open-door settings, awarded Hilker its “Excellence Award” in 2002. Josie Mathias, associate professor, is coordinator of the Accounting program and has taught at Mercer since 1986. She is also a Mercer graduate. Mathias has developed several online courses including Principles of Financial Accounting, Intermediate Accounting I, Cost Accounting, Principles of Managerial Accounting and Accounting for Nonprofit Organizations. She is currently developing an innovative hybrid course called Managerial Accounting that combines both television and on-line instruction. She has served on many college committees such as the Business Division Personnel Committee, the Student Life Committees, the newly organized College Culture Committee and was chair of the College Forum. For the past ten years she has been treasurer of the Faculty Association. Robert Smith, associate professor, is director of Mercer’s Funeral Service program. Mercer is the only college in New Jersey to offer a Funeral Service major. Students have consistently surpassed the national average on the National Board Licensing Exam and have twice in the last four years achieved a 100 percent pass rate. Smith proposed and administers the successful donor program. He is a certified Funeral Service Practitioner and certified pre-planning consultant and continues to practice as a funeral director. He was president of the University Mortuary Science Education Association, Chair of The American Board of Funeral Service Education College & University Council, on the Board of Trustees of NJ Funeral Service Education Corporation and Past President of West Jersey Funeral Directors Association. Robert has chaired national committees to re-write the teaching curricula for Funeral Directing, Merchandising, Law and Management. He is currently on the Board of Directors of the International Conference of Funeral Service Examining Boards. Robert is past president of the Wenonah Lions Club and director for 23 years of their fourth of July 5k run.